1.Backup all the contacts information in your iPhone to your computer, secure and convenient. 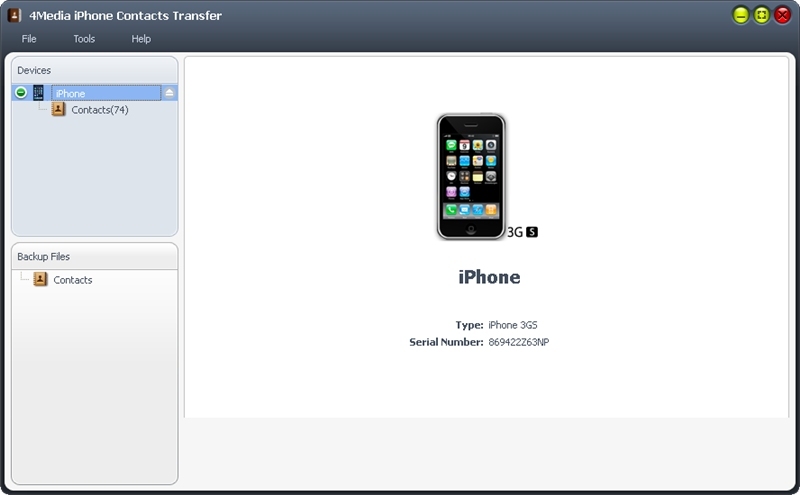 2.You can import/export contacts information files in CSV and vCard formats between your iPhone and computer. 3.Much handy to transfer your contacts list in CSV and vCard formats directly to the phone embedded with address book function or other address book programs, like Google Contacts, Yahoo Address Book, Outlook, Windows Address Books and etc. 4.Lost all contact information? It won't be an issue any more and you can get your contact information back by restoring them from the backup file to your iPhone with this program. 5.Free to delete any contact information item from the list, search contact information by given key word. Sort the contact information according to Last Name or Mobile Phone Number or other categories. Qweas is providing links to 4Media iPhone Contacts Transfer 1.2 as a courtesy, and makes no representations regarding 4Media iPhone Contacts Transfer or any other applications or any information related thereto. Any questions, complaints or claims regarding this application 4Media iPhone Contacts Transfer 1.2 must be directed to the appropriate software vendor. You may click the publisher link of 4Media iPhone Contacts Transfer on the top of this page to get more details about the vendor.